Gauge/Tension: GAUGE: Rounds 1-7 measure 4” (10 cm) across. CHECK YOUR GAUGE. Use any size hook to obtain the gauge. Doily measures 16” (40.5 cm) in diameter. beg 4-dc cl (beginning 4-double crochet cluster) = ch 2, holding the last loop of each stitch on the hook, 3 dc in indicated stitch or space, yarn over, draw through all 4 loops on hook. 4-dc cl (4-double crochet cluster) = holding the last loop of each stitch on the hook, 4 dc in indicated stitch or space, yarn over, draw through all 5 loops on hook. 3-tr cl (3-treble crochet cluster) = holding the last loop of each stitch on the hook, 3 tr in indicated stitch or space, yarn over, draw through all 4 loops on hook. edc (extended double crochet) = yarn over, insert hook into indicated stitch or space, yarn over and pull up a loop (3 loops on hook), yarn over and draw through 1 loop on hook (3 loops on hook), [yarn over and draw through 2 loops on hook] 2 times. Small Shell = (2 dc, ch 2, 2 dc) in indicated space or stitch. 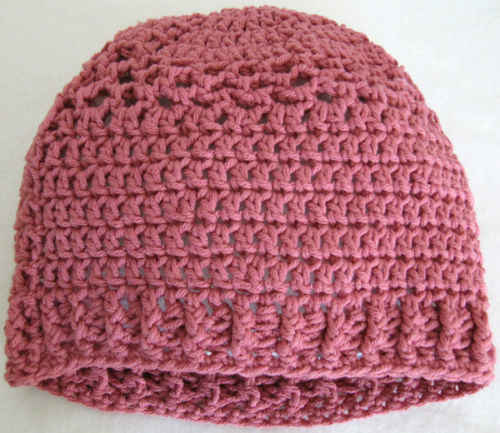 Large Shell = (3 dc, ch 3, 3 dc) in indicated space or stitch. ch-3 picot = ch 3, slip st in top of last stitch made. 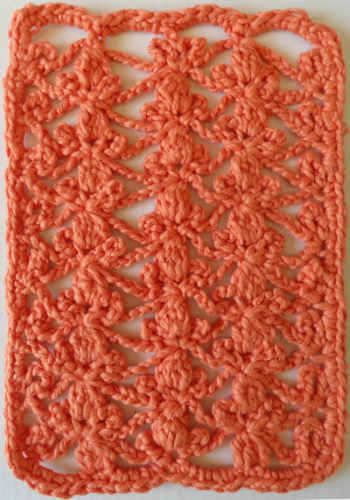 dtr (double treble crochet) = yarn over 3 times, insert hook into indicated stitch or space, yarn over and pull up a loop (5 loops on hook), [yarn over and draw through 2 loops on hook] 4 times. 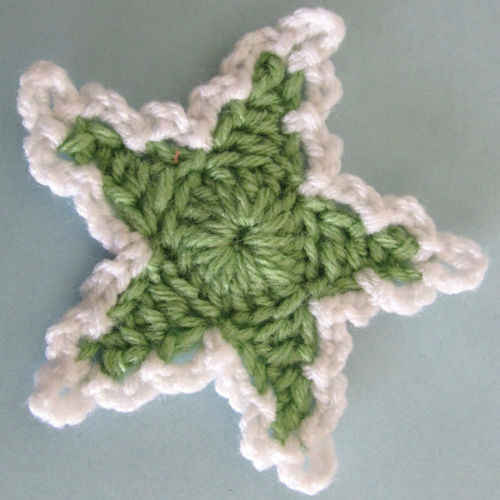 triple picot = ch 3, slip st in front loop at the top of last stitch made, ch 3, slip st in same stitch again catching the front loop of first ch-3 loop, ch 3, slip st in same stitch again catching the front loop of first ch-3 loop and second ch-3 loop. picot-in-ch = ch 4, slip st in fourth ch from hook. Note: Beginning ch-2 counts as first dc throughout pattern unless otherwise indicated. With A ch 5; join with slip st in first ch to form a ring. Round 1 (Right Side): Ch 3, (counts as dc, ch-1), dc in ring, [ch 1, dc in ring] 6 times, ch 1, slip st in second ch at beginning of Round—8 dc, 8 ch-1 spaces. Round 2: Slip st in first ch-1 space, beg 4-dc cl, *ch 4, 4-dc cl in next ch-1 space; repeat from * 6 times, ch 1, edc in top of first cluster (counts as ch-4). Round 3: Slip st in first ch-4 space, (ch 2, dc, ch 2, 2 dc) in same ch-4 space, *ch 6, (2 dc, ch 2, 2 dc) in next ch-4 space (Small Shell made); repeat from * 6 times, ch 6, slip st in second ch at beginning of Round. Round 4: Slip st in first dc and ch-2 space, (ch 2, dc, ch 2, 2 dc) in same ch-2 space, *ch 6, skip next ch-6 space, Small Shell in next ch-2 space; repeat from * 6 times, ch 6, slip st in second ch at beginning of Round. Round 6: Ch 15, skip next shell of (dc, 3 ch-3 picots, dc), 2-tr joining worked over next 2 ch-3 spaces, *ch 12, skip next shell,** 2-tr joining worked over next 2 ch-3 spaces; repeat from * 5 times, then from * to ** once, tr in next ch-3 space, slip st in third ch of ch-15 at beginning of Round. Fasten off. Round 7: Attach B between the 2 tr of any 2-tr joining, ch 1, sc in same space, *(7 sc, ch 2, 7 sc) in next ch-12 space,** sc between next 2-tr joining; repeat from * 6 times, then from * to ** once, slip st in first sc of Round. Round 8: Ch 1, sc in same sc, sc in next 3 sc, *ch 2, skip next 4 sc, [3-tr cl, ch 2] 4 times in next ch-2 space, skip next 4 sc,** sc in next 7 sc; repeat from * 6 times, then from * to ** once, sc in next 3 sc, slip st in first sc of Round. Round 9: Ch 1, (sc, ch-3 picot, sc) in same first sc, *ch 2, skip next 3 sc, sc in next ch-2 space, ch 2, Small Shell in next ch-2 space, Large Shell in next ch-2 space, Small Shell in next ch-2 space, ch 2, sc in next ch-2 space, ch 2, skip next 3 sc,** (sc, ch-3 picot, sc) in next sc; repeat from * 6 times, then from * to ** once, slip st in first sc of Round. Fasten off. Round 10: Reattach B in ch-2 space of first Small Shell on Round 9, ch 10, *dc in ch-3 space of next Large Shell, ch 7, tr in ch-2 space of next Small Shell, ch 7,** tr in ch-2 space of next Small Shell, ch 7; repeat from * 6 times, then from * to ** once, slip st in third ch of ch-10 at beginning of Round. Fasten off. sc) in next ch-7 space; repeat from * around, slip st in first sc of Round. Round 12: Ch 1, sc in same first sc, *ch 2, skip next 3 sc, (4-dc cl, ch 3, 4-dc cl) in next ch-3 space, ch 2, skip next 3 sc, sc in next sc, ch-3 picot,** sc in next sc; repeat from * around to last ch-3 space, then from * to ** once, slip st in first sc of Round. space, ch 7, *Small Shell in next ch-3 space, ch 7; repeat from * around, slip st in second ch at beginning of Round. Shell in next ch-2 space, ch 7; repeat from * around, slip st in second ch at beginning of Round. Round 16: Ch 15, skip next shell of (dc, 3 ch-3 picots, dc), 2-dtr joining worked over next 2 ch-4 spaces, *ch 11, skip next shell,** 2-dtr joining worked over next 2 ch-4 spaces; repeat from * around to last shell, then from * to ** once, dtr in next ch-4 space, skip (sc, ch-4, sc), slip st in fourth ch of ch-15 at beginning of Round. Fasten off. Round 17: Attach D between the 2 dtr of any 2-dtr joining, ch 2, *11 dc in next ch-11 space,** dc between next 2-dtr joining; repeat from * around to last 2-dtr joining, then from * to ** once, slip st in second ch at beginning of Round. from * to last 14 sts, then from * to ** once, sc in next 9 dc, slip st in first sc of Round. then from * to ** once, sc in next 5 sc, slip st in first sc of Round. next ch-3 space, sc in next 4 sc, skip next sc,** sc in next sc; repeat from * around 10 times, then from * to ** once, slip st in first sc of Round. Round 21: Ch 1, sc in same sc, *skip next sc, sc in next 5 sc, 2 sc in next ch-2 space, ch 2, [Small Shell in next ch-2 space, ch 7, skip next ch-6] 2 times, Small Shell in next ch-2 space, ch 2, 2 sc in next ch-2 space, sc in next 5 sc, skip next sc,** sc in next sc; repeat from * around 10 times, then from * to ** once, slip st in first sc of Round. Round 22: Ch 1, (sc, triple picot, sc) in same sc, *skip next sc, sc in next 6 sc, 2 sc in next ch-2 space, ch 2; (dc, ch-3 picot, dc, picot-in-ch, ch 1, dc, ch-3 picot, dc) in next ch-2 space; ch 3, insert hook under ch-6 strand from Round 20 and ch-7 strand from Round 21, (sc, ch 3, sc) over both strands held together, ch 4; (dc, ch-3 picot, 2 dc, triple picot, 2 dc, ch-3 picot, dc) in next ch-2 space; ch 4, insert hook under ch-6 strand from Round 20 and ch-7 strand from Round 21, (sc, ch 3, sc) over both strands held together, ch 3; (dc, ch-3 picot, dc, picot-in-ch, ch 1, dc, ch-3 picot, dc) in next ch-2 space; ch 2, 2 sc in next ch-2 space, sc in next 6 sc, skip next sc;** (sc, triple picot, sc) in next sc; repeat from * around 10 times, then from * to ** once, slip st in first sc of Round. Fasten off and weave in ends. Block Doily to size and shape.